It’s no new observation that digital enables marketers and their agency counterparts to access tons of metrics. So many that for many media people, two days of the week are devoted to collecting and visualizing bajillions of data points in complex reports. 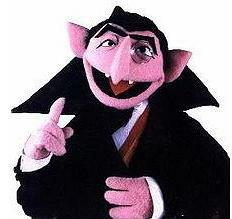 Most of us digital marketers have spent years channeling Count Von Count, the affable vampire from Sesame Street who, upon entering any room, would begin measuring virtually every object in his line of vision. 7! Seven apples! 6! Six balls! 1. One Snuffalufagus! A good way to teach kids numbers, but not a great skill for cocktail party success. Or, for that matter, brand marketing. Our medium gives us access to data on every aspect of consumer exposure and interaction. Impressions, clicks, interactions. Interaction rates, Interaction times. View through conversions. Interaction rates by spot on the ad. Video views. Video view times. Impressions by in market shoppers. Impressions by metro. Interaction rates by daypart. That ability to count has turned us into 100,000 Count Von Counts. 7 million! Seven million impressions! 6 thousand! Six thousand complete video views! 74 thousand! Seventy four thousand clicks during the period 12-4 PM! Trouble is, many of these metrics aren’t in and of themselves terribly relevant at answering crucial marketing questions. Sometimes some of them have value, but often they don’t mean much at all. And the most commonly referenced one of all, CTR, is about as meaningless as they come for most brands. The traditional side of media often feels smug about our incessant counting. They know that many of our metrics are of little value. But at the same time they aren’t offering anything better. For a decade they have been doing jazz hands to cover up the fact that they have few reliable metrics to offer. The solution to tiresome and irrelevant counting of everything is NOT counting nothing. As new platforms and technologies raise the value of digital impressions and make TV and Print impressions less passive and transitory, our converged industry needs to take a new approach to measurement. We need to figure out the data points that matter and only count those. With this smaller number of metrics, we can devote more of our time to figuring out brand impacts and optimization strategies to improve effectiveness. If clicks don’t matter to your business objectives, why count them? Having access to them almost inevitably leads to using them as a surrogate measure of brand impact. They are, after all, eminently understandable, and can be boiled down into a simple figure. This makes them almost magnetic. With the myriad opportunities available for data collection, we can do a lot better than we are now. But doing so requires the time and focus to devise a real measurement strategy. The Real Winners In Social? Content Publishers!